Social media has become a huge part of our lives. There are over 2.4 billion social media users in the world today, constantly adding their thoughts, food pictures, pet videos, and more to the internet. Many industries have benefited from social media. Clothing brands sponsor social media stars to promote their outfits, big-name companies like Wendy's or Taco Bell have put new life into their brands by being active and comical on Twitter, and new, quirky restaurants can attract a cult following over night by having an "Instagrammable" food item. Travel is no exception from this trend. People love sharing pictures of their trips on social media. They'll share beautiful pictures of exciting places they've been or anecdotes about their favorite memories. However, it's also common that we see many complaints about canceled flights, poor customer service, or worse trending on social media. So, what's an airline to do? Just keep on having a social presence and interacting with passengers – no matter how good or bad the comment. 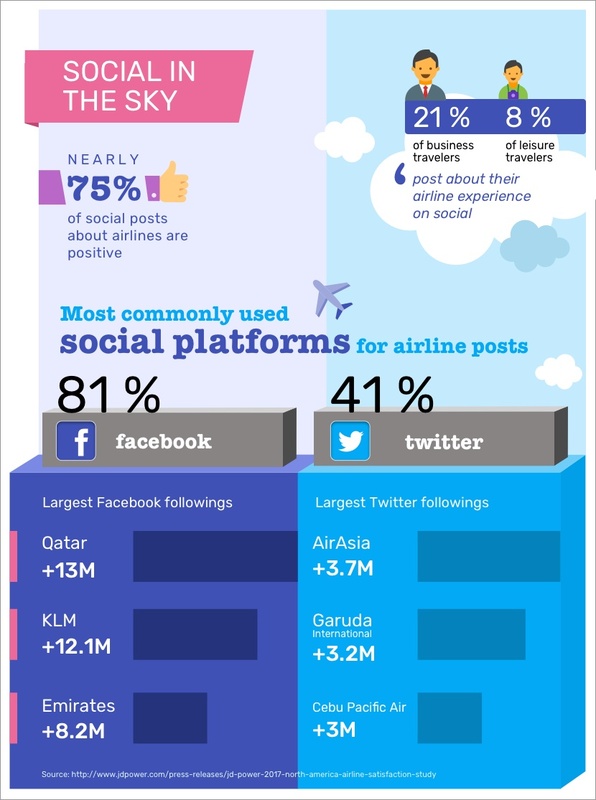 While we tend to see the negative comments trend the most, they are actually a minority of what people are posting about airlines. About 75% of posts about airlines are positive (but it's difficult to make a hard-hitting news story about how much someone loved their flight! ).